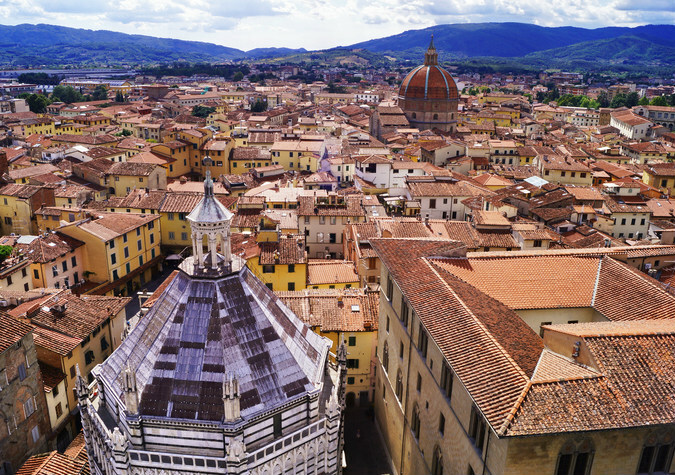 The capital of the Pistoia province sits in deepest Tuscany and is a fascinating yet little visited city, despite being a lovely day trip from Florence, Pisa or Lucca. You can easily get around Pistoia on foot to explore the medieval ramparts and the centro storico (historic centre) as well as its elegant gardens and several striking examples of contemporary art. In fact, one day trip will probably not be enough to see it all. Gracing the beautiful Piazza del Duomo in the centre of the city, this 10th century cathedral boasts an incredibly beautiful Romanesque façade and imposing brick bell tower. Highlights include a lunette of the Madonna with Child and Angels and the Cappella di San Jacopo and the silver altar piece, Dossale di San Giacomo which was started in 1287 and completed two centuries later. Get your tickets for the bell tower and the chapel in the Battistero di San Giovanni. Standing across the square from the cathedral, this ancient church dates back to the 14th century. Octagonal in shape, the baptistery boasts elegant white and green slabs of Prato marble extracted from the ruins of Roman Florentia, along with an ornate, marble font and a magnificent dome. Inside, your attention is immediately drawn to the precious mosaics lining the dome, one of the largest in the world to be decorated using this type of mosaic work. The elaborate images depict Christ in Judgement and scenes from the Last Judgement. Take a walk through this beautiful outdoor sculpture garden with its contemporary works of art dotted throughout the grounds and inside the historic Giuliano Gori family villa. Since the early 1980s, the Fattoria di Celle has hosted a sizeable collection, now totalling around sixty sculptures by international artists which modern art aficionados will love to discover. Make sure you reserve a place on one of the guided tours well which take place by appointment only on weekdays from mid-April to late September. Be prepared for a hearty hike of about three to four hours – comfortable walking shoes are advised. This prestigious gallery inside Palazzo del Tau is devoted to Pistoia’s highly-acclaimed 1940s artist, Marino Marini (1901–1980) and showcases dozens of his sculptures, drawings, lithographs and etchings, many of them female nudes and horses. Cappella del Tau, a tiny 14th century chapel is also well worth viewing with its frescos by students of the School of Giotto and Marini’s famous equestrian sculpture The Miracle. The tiny town of Collodi, between Lucca and Pistoia, was home to the author of Pinocchio. Unsurprisingly, there’s plenty of fun and games for all ages to be found here where Pinocchio the puppet once dreamt of becoming a real boy. Pinocchio Park is an outdoors paradise consisting of a large, beautifully laid garden featuring all the main characters of Pinocchio’s story along with bronze sculptures and other works of art. Don’t miss mounting the giant dogfish shark statue (the whale that swallows Pinocchio and his father in the story) – climb up the steps to its head where you can spy everything in the garden. The Garzoni Garden and The Butterfly House lies a few minutes’ walk from Pinocchio Park and makes for more marvelling at glorious gardens. It is in fact regarded as one of the most beautiful gardens in Italy with its perfectly manicured walkways and flower beds, along with its fountains and statues. A large greenhouse hosts the Butterfly House, filled with tropical butterflies. You can visit from March to October. Pistoia’s thermal baths often provide a welcome rest after all the sightseeing. The spa waters of Montecatini and Monsummano offer great health benefits and are a treat in themselves. They once hosted nobility and royalty and, more recently Italian stars and celebrities. Montecatini Terme sits some 15 kilometres west of the town of Pistoia and is considered to be the biggest spa town in Italy. Hotels, trendy restaurants, clubs and theatres abound as do opportunities to pamper yourself with some Italy’s best spa treatments. Monsummano lies just 9 kilometres from Pistoia and sits majestically atop a hill with its medieval castle and great views of the plain below. Enjoy the restaurants, guest houses and, of course, the healing waters, especially at the prestigious Grotta Giusti – they’re sure to make you feel on top of the world. For outdoors and sport lovers, Pistoia’s surroundings are also a delight. Hiking trails abound or you could let the ski lifts take you there during summer or winter – skiers generally take to the slopes at the well-equipped resorts of Abetone and Val di Luce. Star gazers are in their element too: The Astronomical Observatory of Pian de’ Termini sits in a remarkably quiet location, free from light pollution, making it the ideal environment for observing the skies. Analyse the sun through the telescope and binoscope and at night time, observe fascinating planets and other celestial objects which appear at various different times of year. Another great pleasure of Pistoia is the indulgence of Italy’s great chocolate. The ‘Tuscan chocolate valley’ extends across the mountains between Pistoia, Pisa and Prato and is home to several world-renowned Italian artisan chocolatiers – it might be time to indulge yourself like never before! Find out more here.